Strong and smokey or soft and pretty? There's no need to choose with Bobbi's beautifully-edited selection. 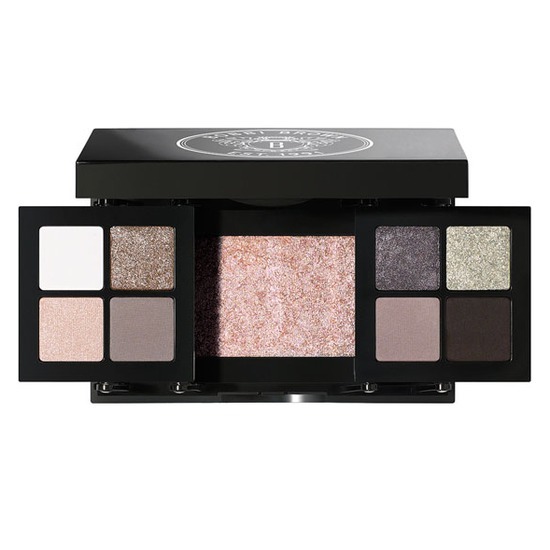 Featuring eight shadows and a luminescent skin enhancer, this mirrored palette makes it easy to create a multitude of party and special occasion looks. Taking a cue from the look of something pretty against something edgy, the set includes rich caviar and pearlescent black shades. Introducing the standout star of the season, Ballet Sparkle, a shimmer so sheer it can be worn on both eyes and cheeks (without ever looking overdone). Bobbi Brown is an institution. Her application technique is clean, simple, straight forward and classic. She has made makeup more approachable and less intimidating for a lot of women. Bobbi Brown has really nailed her technique into something similar to a Pythagorean theorem: If you follow the basic rules of makeup technique, color theory, and design, you'll get a great simple look that will make you look like a pro MUA. That being said, I have never been a big fan of Bobbi Brown's makeup. Her palette colors usually make me yawn. I tend to go for big and bold or very dark and vampy colors; It's just a personal preference. I came across this Caviar and Oyster Palette yesterday, and it really caught my eye. I took a few swabs of the palette colors and it intrigued me. So, I bit the bullet and purchased this palette. I did an application with this palette and all I can say is Wow..... The colors are rich and lush; almost velvet like. You can create a wicked smokey eye or a soft, almost romantic looking eye, and the luminescent skin enhancer really completes the looks. If you are really into the smokey eye look, pair this shadow with Too Faced Perfect Black Orchid Waterproof Eyeliner. This is a black liner with a strong and distinct purple hue, and it's looks phenomenal paired with this palette. I highly recommend this palette; it's a great multipurpose palette that will meet and exceed expectations. Based upon this one palette, I will be paying more attention to Bobbi Brown's collections, and for anyone that knows me and is familiar with my work, that is a BIG deal.